Surveillance footage shows one armed robbery suspect, who went inside the 7-Eleven store on Aug. 29, while the other stood outside serving as a lookout. 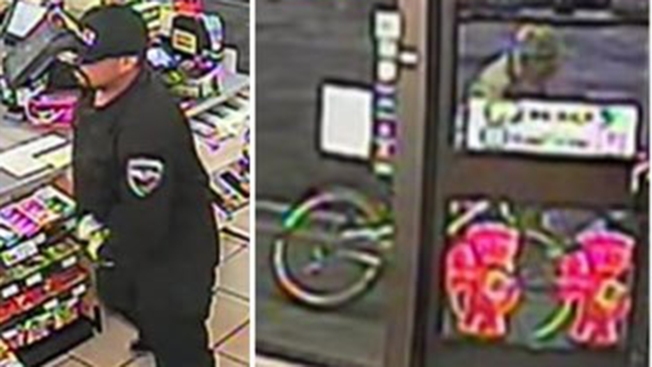 Police released images and a video on Wednesday of two men wanted in a late August armed robbery at a 7-Eleven store just outside downtown San Jose. One of the suspects went inside the convenience store located at 452 E. Santa Clara St. shortly after 9 p.m. on Aug. 29 while the other stood outside serving as a lookout, police said. The man who entered was armed with a handgun and demanded cash from a clerk, who complied with the command, police said. Both suspects left the scene on mountain bikes heading down southbound 11th Street, according to police. A video of the robbery obtained by police can be viewed online. The armed suspect was described as a man between 35 and 40 years old with black hair and a goatee. He was seen leaving on a silver mountain bike and wore black pants, a black jacket that possibly had security guard patches, black shoes with white soles and tan gloves, police said. The other suspect was seen in a light-colored hoodie and dark-colored pants. The mountain bike he rode might have been yellow, according to police. Anyone with information on the case is asked to call police Detective Mike Drago at (408) 277-4166. Those who wish to remain anonymous may call Silicon Valley Crime Stoppers at (408) 947-7867.